You were honoured to have the hawk visit your yard though, and hopefully it wont become his regular habit. 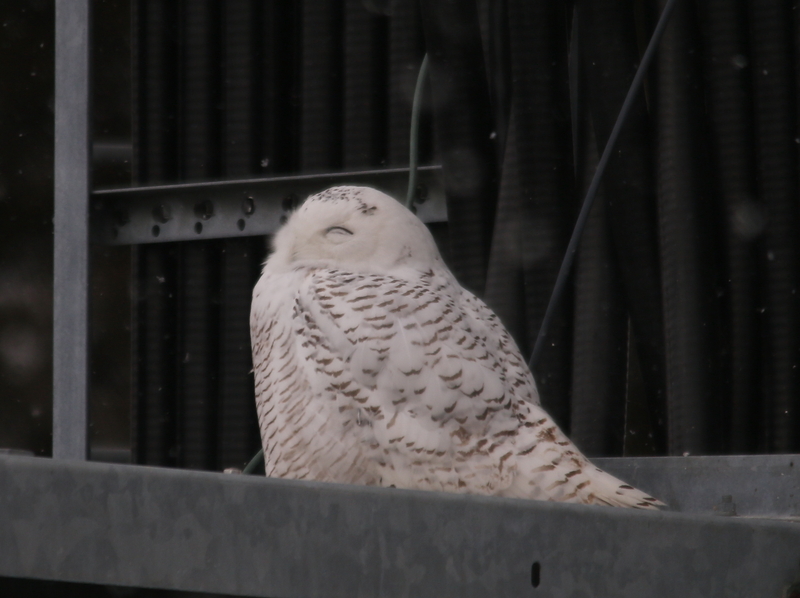 For the last month there has been a snowy owl spotted in the city of Omaha. Its location is rather dangerous, it has been seen sitting on a merging traffic sign along the interstate freeway and exit off ramp road, even perching on the cement rail of the overpass road. Flying down into the grassy section and grabbing some little mouse or vole. Off to the side of the interstate there is a communication tower (cell tower), she uses that most of the time for her daytime perch. I had a trip planned to go see the grandkids so this was my opportunity to look for her since this is just a few blocks from their house I started out early afternoon to see if she was in her resting spot, my luck no where to be seen. I checked a few other spots on each side of the interstate and then found my way back to the tower area. as it was getting dark just after sunset- amazing she flew into a small tower with a road cam on it, right above the interstate. I have her spotted now, she is silhouetted against the sky but she doesn't stay long. Down she went into the grass below the overpass. Soon up she came and landed on the cement rail of the road, traffic was zipping by her (I wonder how many really even noticed her). I was snapping pictures like crazy. I looked closely and sure enough she had something in her talons. She stayed there for a bit and down she went again and then came up on a merging traffic sign. There must be a good supply of food that lives in there. I watched till it was really dark and she was comfortable on the sign. 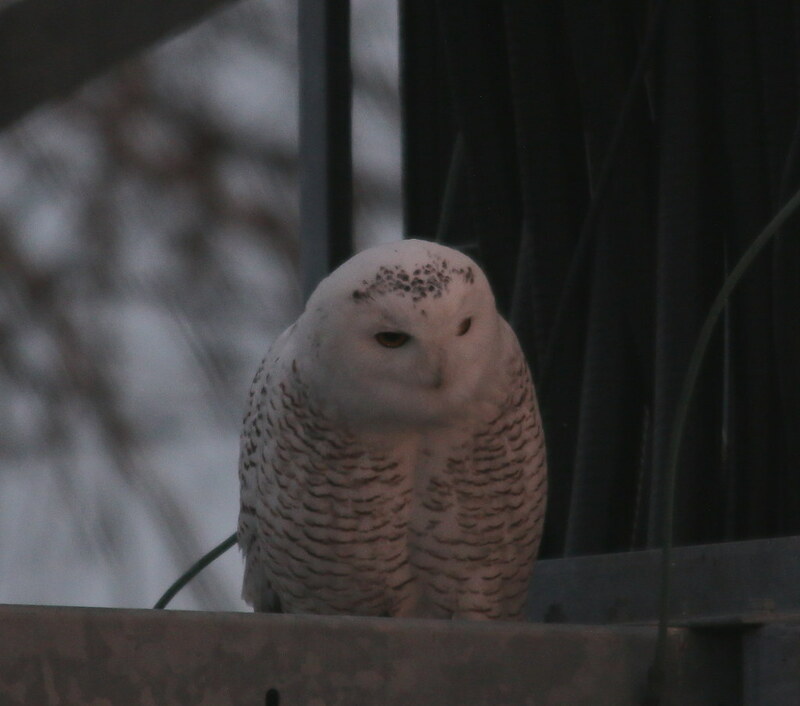 Early the next morning I went out to see if she would return to her day perch spot on the tower and bingo I drove up and there she was. She was looking around and then I could see at times she would squint her eyes and then some would have them totally closed. Must be night time for her. Before I left to come home I stopped by and she was still in the same area but at this time we had some little snow flurries falling. There were a number of cars in this lot watching her. I wished her well and I left to come home. She sure was a really pretty owl. I hope she stays safe and will soon leave to go back north. 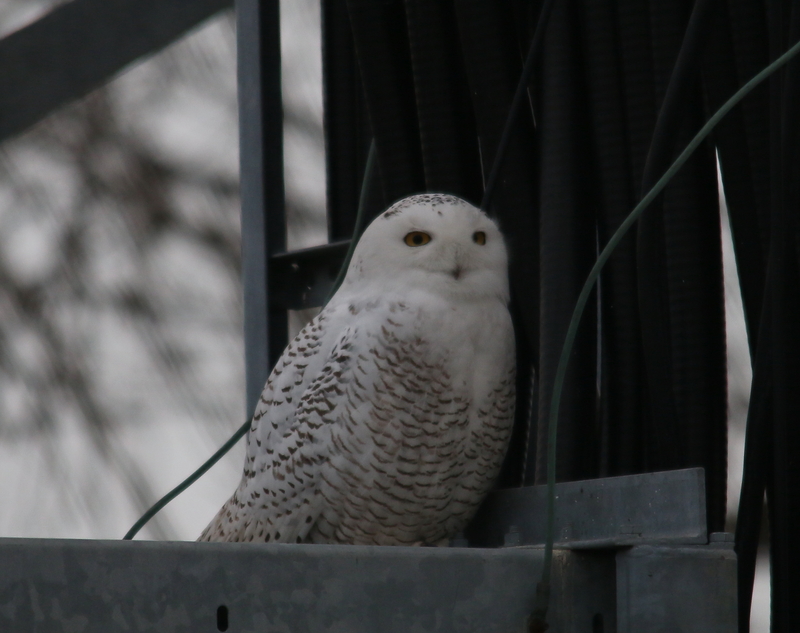 Photos of the snowy owl and the area she has been staying in. Sure hope the owl stays away from the road!!! Beautiful! The next morning it was time to go and see if she was still in the area. 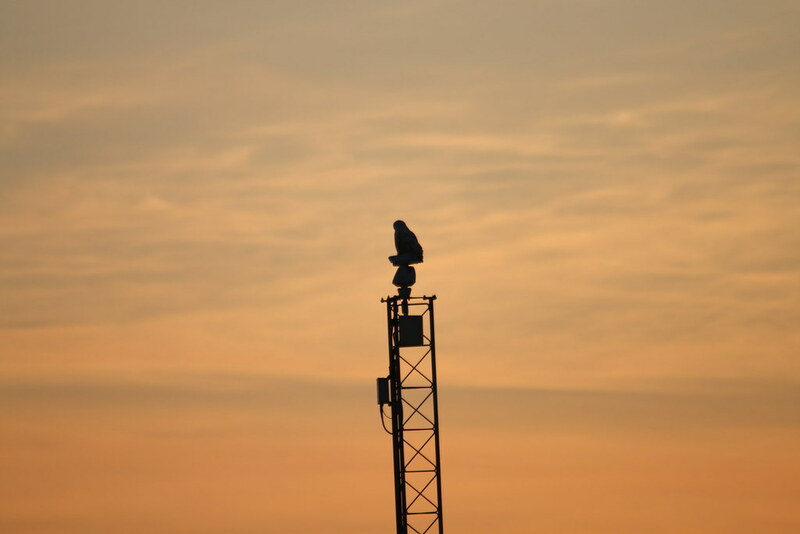 I had been told she likes to perch on this communication tower just off the interstate road. There is a little parking lot that I drove into and sure enough there she was right above the little building on a beam. I shut off the car and rolled the window down, there she was and she didn't seem to notice me. The sun was not up and it was going to be cloudy (not so good for pictures) still there she was. She was alert and looking around, at times she would squint her eyes and sometimes just close them. She seemed very comfortable there, I didn't want to leave but I thought before I left town I would go check on her again. Wonderful sighting and photos, Deb! 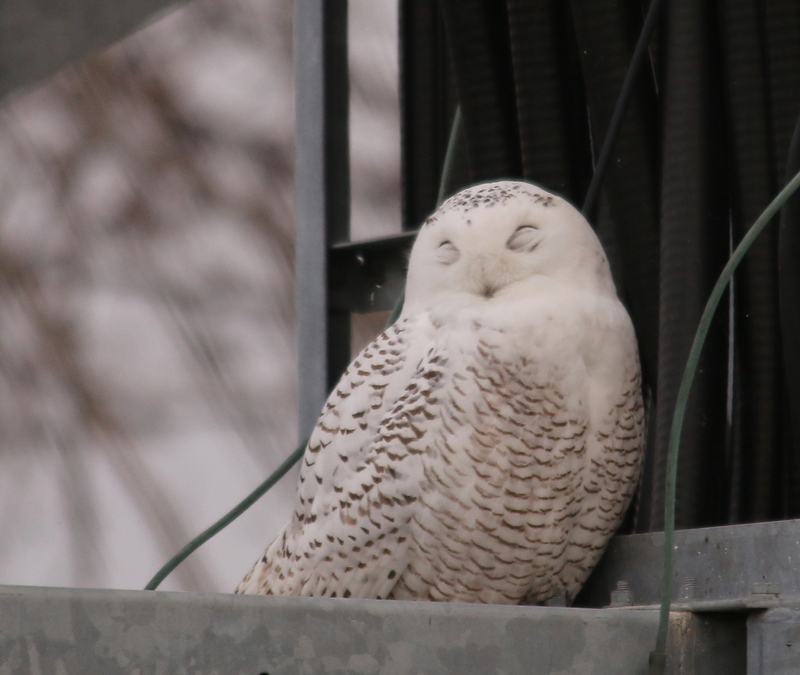 Someone posted photos for a sighting (I forget where) and the owl had a transmitter; must be one of the Project SNOWstorm owls. 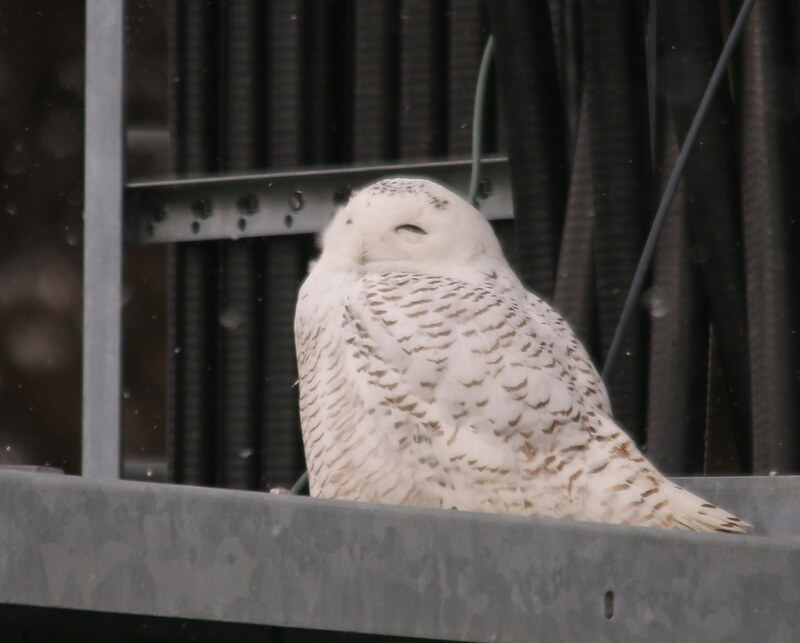 ETA: added the next morning : today’s snowy Owl alert email included a sighting from Nebraska and it might be this same Owl as there was a photo included and the setting looks similar. you Nebraskans have been blessed by this visit - how lovely! Thank You Nancy for that info. I will do that when I have heard that she hasn't been around. I was looking back and I have the first report of her being seen on Jan 6. 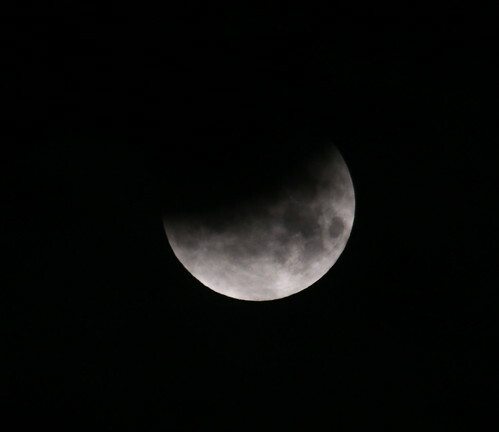 January 31 during the early morning there was a lunar eclipse happening. Well of course this was going to be the second full moon of the month which is called a Blue Moon which doesn't happen often. It also was a super moon which means it is a bit closer to the earth (the moons orbit is a little elongated). When the earth passes between the moon and the sun we get the lunar eclipse which is also called the Blood Moon. 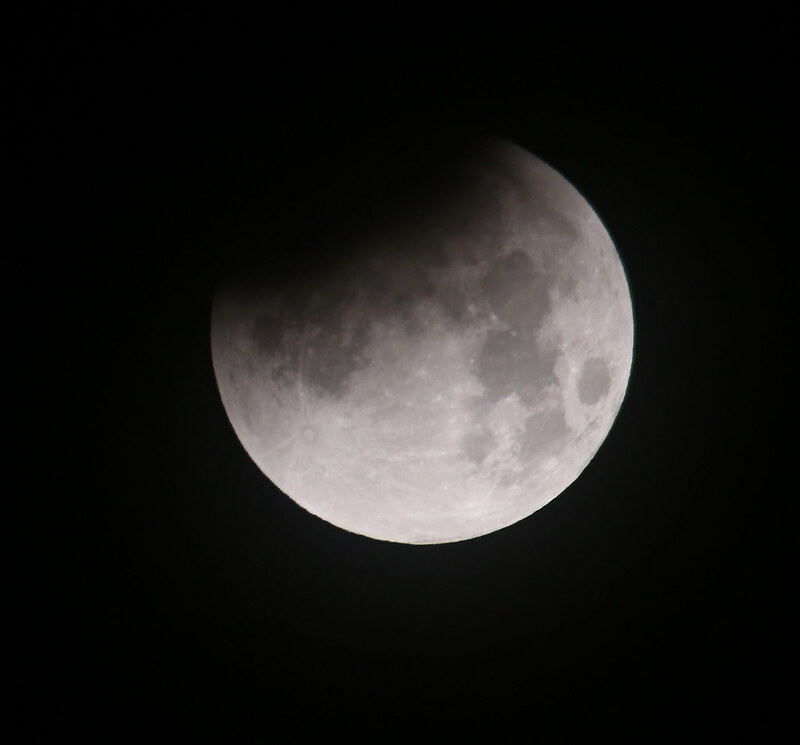 The moon being in the shadow of the earth takes on a reddish color. All very neat - A super blue blood moon eclipse !!!! Checking the forcast it doesn't look good for me--clouds predicted I decided to set my alarm for 5 anyways and at least look outside, so I wake at 4 and can't go back to sleep. I look outside and see shadows on the ground, looked out the back and there is the moon bright as can be. I gather my camera and things and head out to the country so I will have a nice open sky. Got set up and now I just need to wait for it to start. I can see a few clouds off in the distance but nothing serious, little clouds pass, the eclipse starts in the upper left corner. About half way i see there are more clouds building from the west. This is not good as it is going to be just a bit before it gets to totality and the redness will show. Sure enough the clouds covered the moon and that was the end for me of the eclipse. Here are the photos that I got before totality. NASA live streamed that event which was wonderful for Ontarians because the eclipse did not occur in our area - only west of us. They called it a "trifeca" super-blue-blood moon eclipse. They are so rare that one had not occurred since 1866. I got up at 4:00 also because I didnt want to miss the live streaming of that event. You have my sympathy about the clouds ruining the full eclipse but it is wonderful that you got as much as you did of it. Thank you for going to so much trouble and for posting what you captured. there will of course be other blue moon eclypses long before another trifecta. Found an area where Short Eared Owls hunt and live. It is a very rich wet land area. 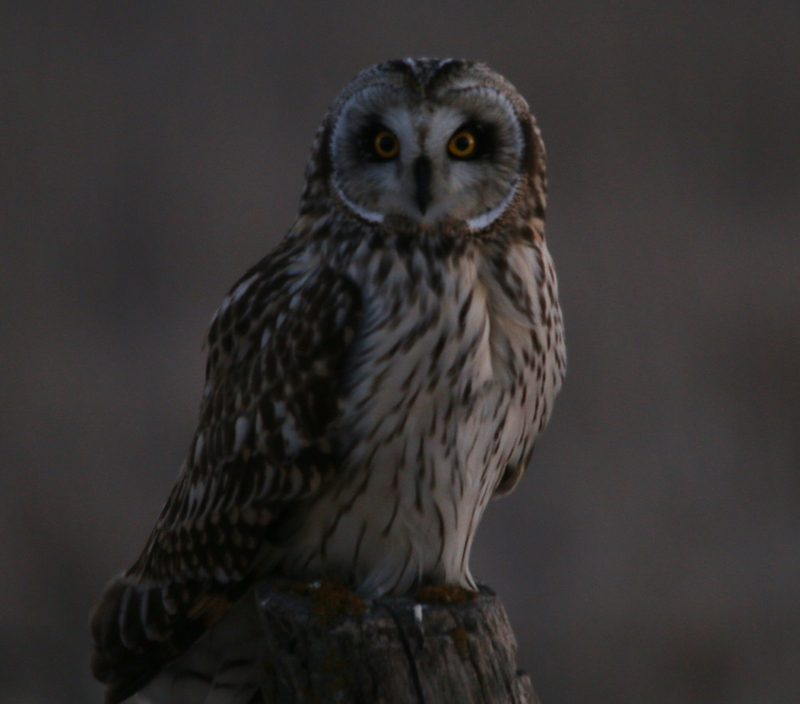 Short Eared Owls are ground nesters which come here during the winter. 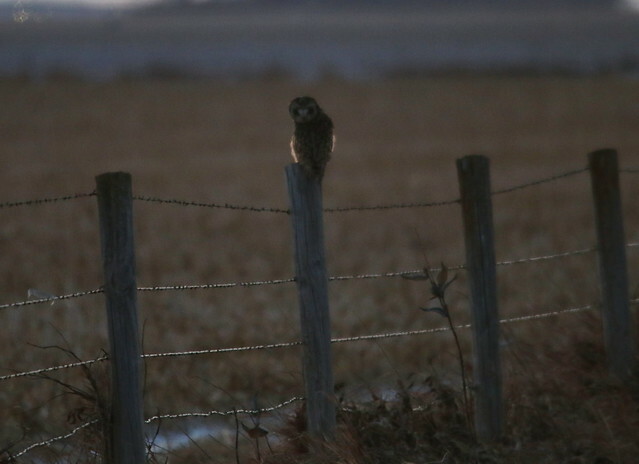 They perch on fence posts out in the open as they look for prey. They have long wide wings which they can float over the field looking for food. 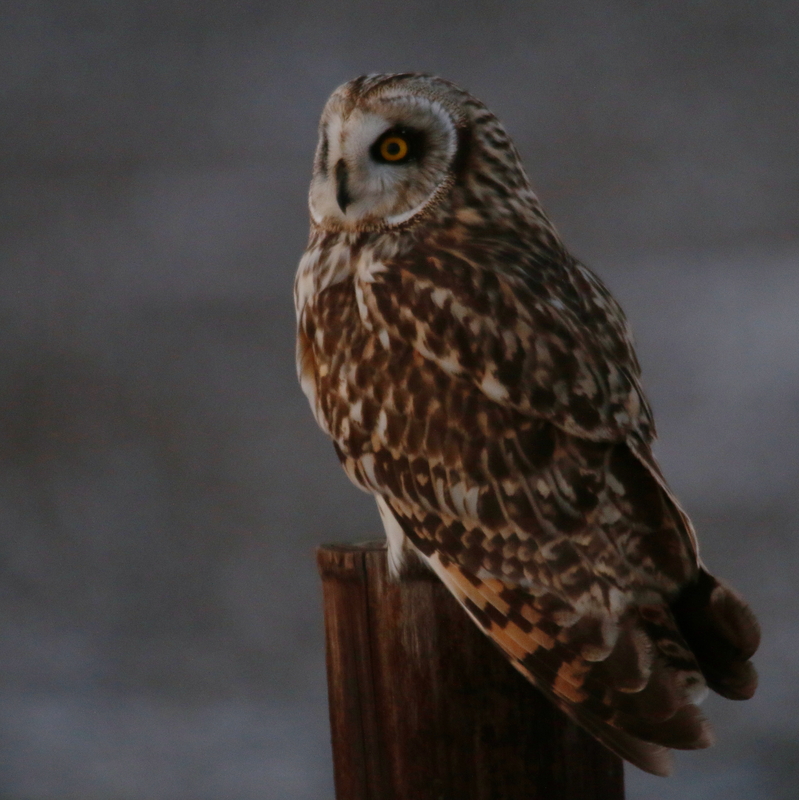 Tonight out looking for them I saw 2 sitting on the posts and 4 flying over the field. Great place to live when you love wildlife, Deb!